Scaffolding should be erected by at least two people. 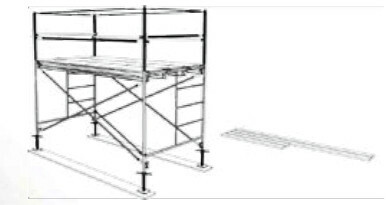 One person should be knowledgeable in erecting scaffolding to supervise the work. These step-by-step instructions are only a general guide. 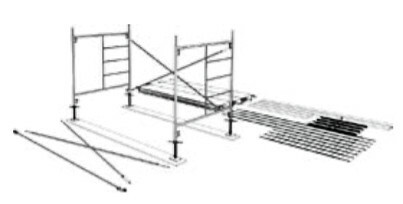 The following example is based on building a scaffolding that is 7 x 5 ft. by 1 frame high. Step 1 Select and prepare the ground area. Place suitable sills and make sure there are no holes under the sills. Select the equipment you need and place it near the work area. Put the adjustable levelling jack plates on the sills in the location that matches your scaffold dimensions. Do not secure the bases to the sills at this step. Step 2 Adjust the nuts of the levelling jack, starting at the highest point of the ground level. The nuts at the highest ground level should be set to 3-6 in. from the top of the sill, depending on the slope. Place the first frame onto the base at the highest point. Connect the first cross brace to the frame. Allow the frame to lean slightly forward and rest on the sill while you prepare for the next frame to be installed. Step 3 Install the second frame onto the levelling jack. Secure the first cross brace to the second frame. Step 4 Install the second cross brace to both frames. Next, you need to level and plumb the scaffolding. Start at the highest point of the scaffolding. If possible, use the levelling jack to bring the highest corner down closer to the sill. Next, bring all four corners up to that point. If the bottom cross braces of each frame are level with each other, then frames should also be plumb. 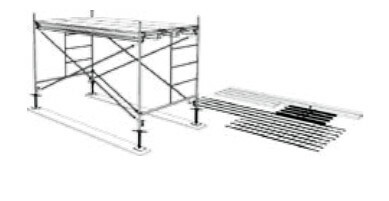 Install the diagonal brace to keep the scaffolding square. Check the level again and plumb if necessary. Fasten the levelling jack to the sills with either nails or screws. 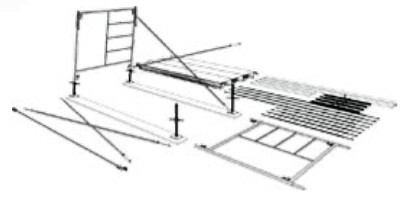 Step 5 Install the deck, which may be an all aluminium platform or with wood deck or scaffold planks. If using wooden planks, they must extend beyond the supporting points at least 6 in. but not more than 12 in. . Secure the deck so it cannot move. Step 6 Install the guardrail posts onto the coupling pins seated in the top of the frames. Put a pig tail lock through the top and bottom of each coupling pin to avoid any separation. Step 7 Attach the guardrails to the posts on all the exposed sides.